Chrichton's World: Review Summer of 84 (2018): Wonderful throwback to Eighties horror! Review Summer of 84 (2018): Wonderful throwback to Eighties horror! This is what I am talking about. Next to pure Eighties nostalgia and atmosphere you actually have a compelling mystery to chew on. If you liked Stranger Things then you definitely will love this one since it's far superior in every way. It actually does more in little time. Summer of 84 captures the Eighties perfectly. It looks, feels and sounds like the Eighties. Granted Stranger Things succeeded in this too. However Summer of 84 also shines in paying tribute to older Eighties films like Stand by Me and The Burbs. Maybe The Bedroom Window (with Steven Guttenberg) which was heavily inspired by Rear Window. More likely the latter. Like these thrillers the film takes it time to set up the characters and mystery. In hindsight this is a brilliant move because you get to know the main characters and you will root for them. The boys really made you believe they were good friends. I also liked how the relationship between Nikki and Davey was nice, sweet and friendly. I appreciated that she was depicted as a true friend instead of a forced love relation. Summer of 84 also adds a sense of tension and dread since you do feel things aren't quite what they seem. Maybe it's only me but at certain points I did let my imagination run wild since the film does allow you to come up with your own theories of what is going on. However it gives you enough subtle hints to steer you the right way. At the same time you are also being misdirected a lot to make you doubt whether main character Davey is right or not. He is kind of a conspiracy nut and is known for coming up with the most fantastical tales.. And naturally like always in films like these people very easily dismiss those but can't even be bothered to look at things logically. Another thing I liked was how the film took itself seriously. There was enough comic relief and other shenanigans.But it never let that get in the way of the graveness of the events. Because make no mistake. The film might start out light and charming it does become quite dark and chilling in the end. Purely because of the atmosphere. Proof that you don't need jump scares. Even if there are some effective ones. 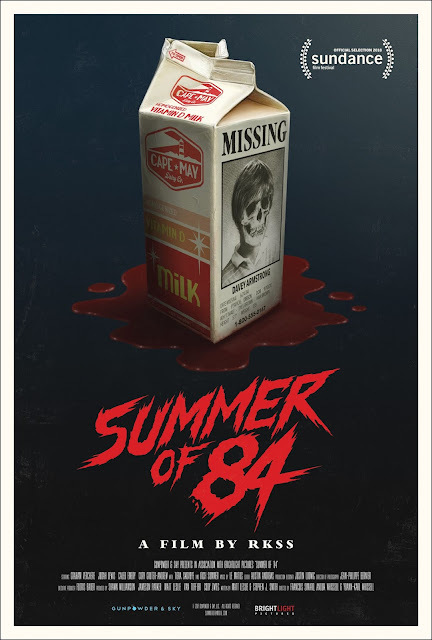 Overall Summer of 84 does more than simply throw back to that magical decade. It also manages to instil terror with very minimal means. A must watch for sure. p.s. Turbo Kid was on my to watch list. But for some reason I haven't gotten around it. You can bet that after having seen this that I am a million times more motivated to watch Turbo Kid. Almost made me regret not having watched it sooner. Better late than never right?